My dream wardrobe would be wearing glitter & glitz all day, every day. Since I'm not a Vegas showgirl, this isn't realistic but I still like to sprinkle glamour into my outfits when at all possible. On Sunday I met with local fashionistas (Darcy, Kate, Marcia, Emmett & Laura just to name a few) for a bloggers brunch followed by vintage shopping so it was the perfect time to wear some of my flashy pieces like this black sequined vest & brown glitter heels. Do you wear sequins & shine during daytime or do you reserve the glitz for evening? How lovely. I share your affection for sparkle (physical and metaphorical). With judicious judgment, we can incorporate it into daily life, as you smartly do here. I imagine, in our past life, we were two Vegas showgirls, sitting next to each other in the dressing room, dishing dirt and sharing makeup. And then going on stage to impress huge crowds with our talent and beauty. I love adding in some sparkle for daytime, you have to have a little something like that sometimes to make the day more fun! I think you did so in a very tasteful way and I really love the shoes! I love sequins in the daytime! It's fun to punch up an outfit and do something a bit unexpected. I wear everything my mood tells me to wear.. doesn't matter what time it is. and I think your bold vest suits especially well with that leopard scarf. and red is a great accent here! yes i wear sequins all the time. i have four tops that have 'simple sequins' on them. 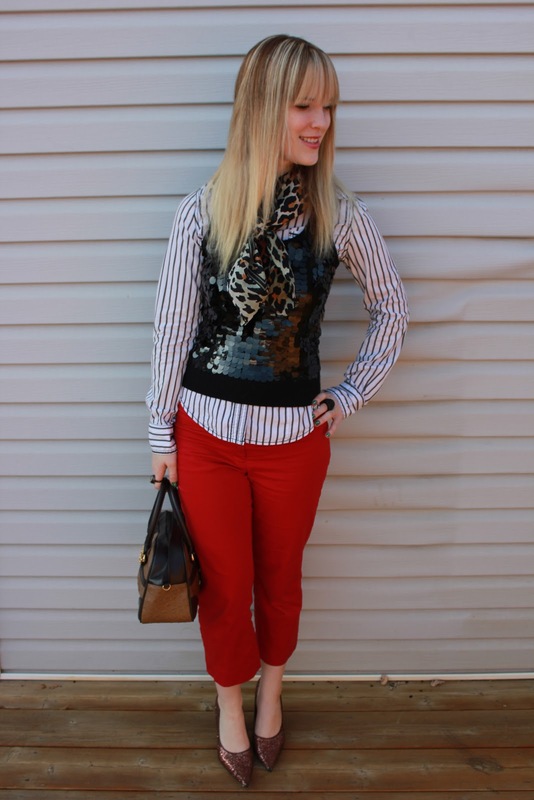 hence the blog name of mine = simple sequins. hahahhaha. your ensemble is very nice and the sparkle is just enough. that's a nice touch of sparkle! i love sequined tops. i just bought one! you look cute girl! 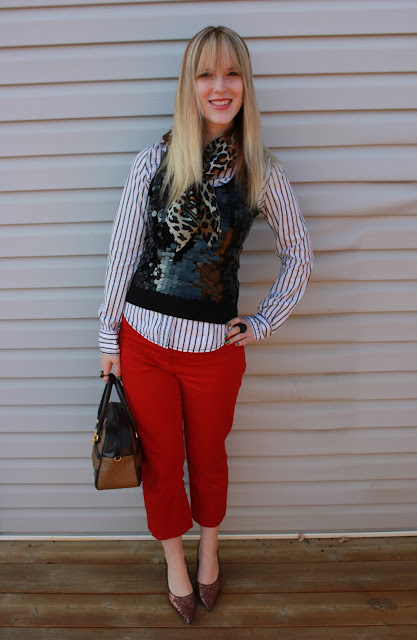 Lovely shirt & vest match! loved your glitz on sunday, definitely put me in the mood for holiday fashion! You looked so holiday chic! red with the leopard print looks exceptional! i hope you had fun at the brunch. i do wear glitter and sequins during the day. in fact the purse in my most recent post is sequined. it's true.